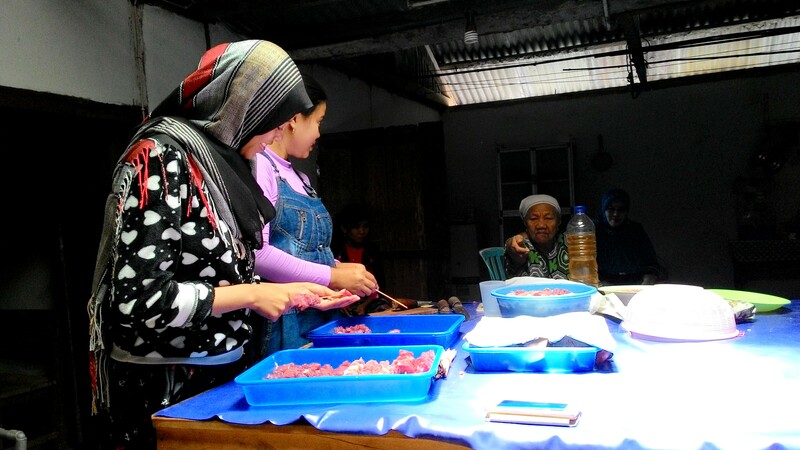 Having been exposed to my first Idul Adha experience last year, I was thrilled to have the opportunity of a second year to learn more about the specific traditions surrounding this celebration in Indonesia. Idul Adha, often called Eid al-Adha outside of Indonesia, reflects the story of Ibrahim and Ishmael. Similar to the way Ibrahim sacrificed a ram after an angel told him he did not actually need to sacrifice his son, Muslims around the world sacrifice cattle, goats, and sheep, and share the meat from these animals with family, friends, neighbors, and the poor. Last year, after being forgotten about in all of the excitement (understandably), I never saw the actual sacrifices done at my school. This year, however, I was part of most of the day’s celebrations. I was picked up early in the morning by my kepala sekola (headmaster), and taken to his family’s Idul Adha. The day starts with prayer: the streets are filled throughout the morning with people going to and from the local mosques, and parts of some streets are even closed. Because I was going to my headmaster’s mother’s house, I observed most of this from the windows of his car. Watching Ibu-Ibu and Bapak-Bapak walk home in their prayer clothes is one of my favorite sights here: it reminds me of the chatting that happens after Sunday mass lets out in my hometown, and while I am not religious, I admire the community that comes out of religion. One everyone returns home from prayer, the sacrifices begin. One bull was already sacrificed by the time we arrived (only males can be sacrificed for Idul Adha), and I was ushered to the front of the crowd surrounding the area where the sacrifices were taking place (there are times when being an honored guest can get you into slightly awkward situations), a spot it seemed many others were vying for. Following the slaughter, the carcass was skinned, and the meat was divided into even portions. Last year, I was able to help with this portion of Idul Adha at my school, but because I was in more of a desa (village) setting, the day’s events followed a more traditional route, and it was only the men who surrounded the piles of fresh beef. I sat with the women during this time, chatting and smiling for a million selfies. Following this, however, the meat was brought to the kitchen, and it was the women’s turn to take over. At first, I was told to sit and watch from the corner (again, being in a unique position as a guest is sometimes challenging to navigate), but eventually dived in anyway, and was soon skewering meat onto tiny wooden sticks, to be grilled into sate later. I can’t fully express how thankful I am to have been so welcomed, for the second year in a row, into this Muslim celebration. Coming from a country where many Muslim students still have to miss school to participate in this important holiday (though the recent change in New York City gives me hope that this might change), the beauty of this day and how it plays out here is certainly not lost on me. Like so many holidays, both religious and secular, this holiday brings families and whole communities together, for a day of sharing food, laughter, tradition, and love. To be honest, I actually didn’t know I was going to an Idul Adha sacrifice when I was picked up. I had been told I was going to a school celebration on Saturday (which I ended up coming very late to, due to car-pool confusion, so I’m actually quite glad I had an unexpected day of Idul Adha), but all my kepala sekolah told me about Thursday was that he wanted to introduce me to his family. But, as it usually goes in Indonesia, I was surprised (pleasantly so) when we got to our destination. The only bummer was that I only had my phone, and not my actual camera, with me for the event. Sitting in the Denpasar Airport, waiting for the friend with whom I would be staying for the duration of my holiday travels, I was already experiencing a kind of reverse culture-shock, and I had not left Indonesia. The crowds passing by the secluded corner where I had tucked myself and my backpack were predominately white, English-speaking tourists, off to spend their holiday on the beaches of Bali. 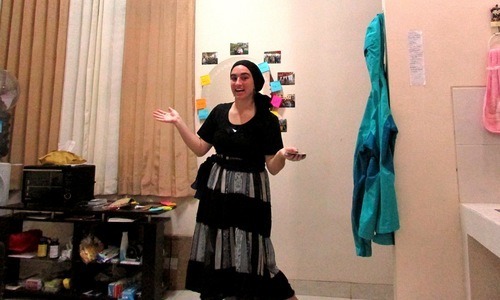 I looked down at my long batik skirt and conservative top, and felt completely out of place, when I should have felt more at home than I have in months. I sent a hasty SMS (the Indonesian phrase for “text”) to my sitemate, attempting to articulate how alien I felt in this place, and prepared myself for a holiday vacation that would be quite unlike anything I had ever experienced before. Coming from a farming family for whom the perfect trip usually entailed going to some kind of cattle show, tropical vacation destinations have never really been on my radar, and so I had first learned about the island of Bali within the context of religion in Indonesia, as I researched the history of Islam in Indonesia for a project in an elective World Religions course. For a long time, I knew Bali mostly as the Hindu-majority island tucked into the middle of a Muslim-majority nation, a fascinating exception-to-the-rule that I hoped to be able to see first-hand during my time in Indonesia. 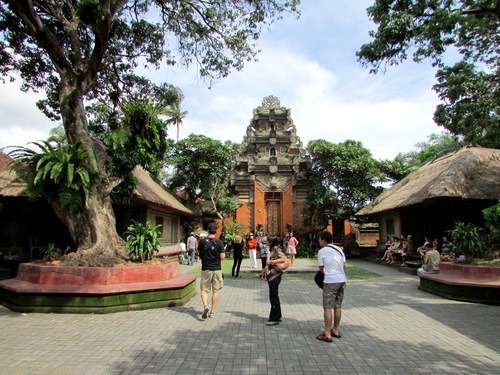 However, as I dove into every book my college library had on Indonesia, both for my World Religions class and to prepare for the nine months I would be spending in this spectacularly diverse country, I found that Bali also played a key role in discussions about cultural tourism and touristic culture. Tucked in between larger volumes I found a small book by Shinji Yamashita called Bali and Beyond: Explorations in the Anthropology of Tourism, which examines the ways in which the cultural tourism of Bali has begun to create a touristic culture. Essentially (to summarize an idea which is much more complex that I am about to make it sound), Bali’s focus on tourism as an economic necessity is changing the culture of Bali itself, and it has even altered the way Hinduism is practiced in many parts of the island. Living on Java, in a Muslim-majority area in which any tourism that makes itself present focuses much more strongly on natural tourism rather than cultural tourism, I confess I have not given an excess of recent thought to either Hinduism in Indonesia or touristic culture. 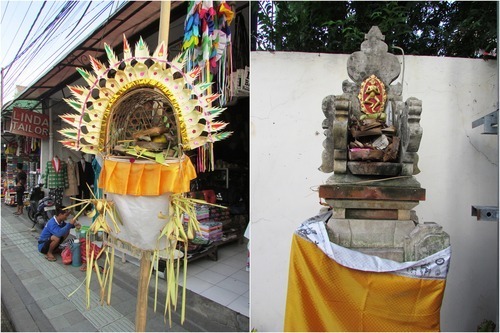 However, both these ideas were in the forefront of my mind during my short stay in Bali. That Bali is a Hindu island became apparent from the moment we arrived: the architecture of the airport, like that of many buildings in Denpasar, the extremely touristy capital city in which my friend and I stayed, emulated that of Hindu temples; and from the windows of the taxi which took us to our hotel, I found myself gaping at huge statues of various Hindu gods and goddess, and losing count of the small shrines shattered in front of homes and shops. I did not hear the call to prayer once while I was in Bali, where pura-pura (Balinese for “temples”) are much more common than masjid-masjid (Indonesian for “mosques”), and it took me a few days to adjust to seeing small offerings—containing food, flowers, and the occasional cigarette—scattered about on the sidewalks everywhere we walked. I must admit that I know far more about Islam and other monotheistic religions than Hinduism and other “Eastern religions,” and I often had to ask guides and waiters what were probably beginner questions in order to contextualize what I was seeing around me. 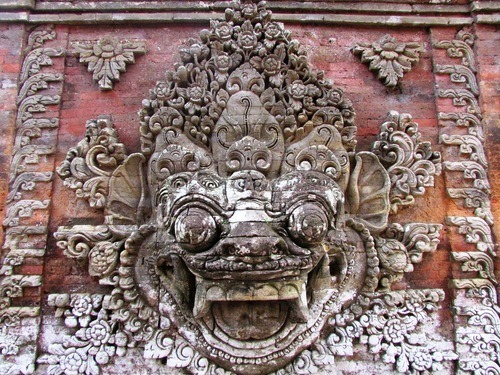 But even as it was the smaller details that made it clear to me that Bali has maintained much of its religious roots, there were, of course, more grandiose examples of the culture which fuels so much of the tourism on Bali. While we only were able to visit a few of the larger temples—mostly on a day trip to Ubud, the city north of Denpasar perhaps most familiar as the setting of the Indonesian section of Elizabeth Gilbert’s Eat, Pray, Love—we did enjoy the ornate beauty of those we saw. 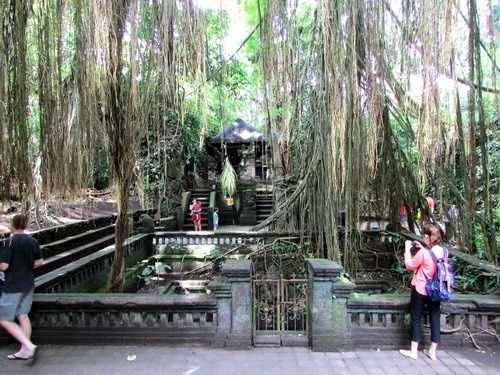 My favorite was Pura Taman Saraswati, a temple in central Ubud dedicated to Dewi Saraswati, the goddess of wisdom and the arts. Gazing at its peaceful setting amidst trees and lotus flowers allowed me, for just a moment, to relish in the singular culture of this island, and forget the giant Starbucks directly behind me. Hindu architecture and iconography followed us wherever we went, from temples to coffee shops to Ubud Palace, where the royal family still lives. The orange and red brick buildings and detailed stone carvings were very different from the colorful tile roofs of mosques and the brightly painted single-story houses I have become so accustomed to seeing in other parts of Indonesia, but I could not but appreciate the earthiness they exuded, and the contrast they provided to the brightly-lit shop signs that were scattered among them. Ubud was by far my favorite part of our short visit to Bali, with its abundance of culture and its quieter tourism. My friend and I stayed in the Kuta area, which gave us excellent access to the beach and to a variety of restaurants and shops, but the particularly Western feel of Kuta, with its night life and English language dominance, was a continual source of discomfort for this American farm girl whose adaptation to Indonesian culture meant she could not stop saying “Maaf, permisi” (“Sorry, Excuse me”) to those who were clearly not Indonesian. 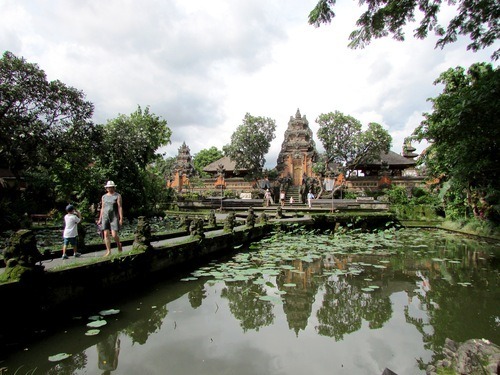 In Ubud, though there were still more foreigners than I was accustomed to seeing, I felt as though I were still in Indonesia, albeit not the Indonesia that I live in every day. 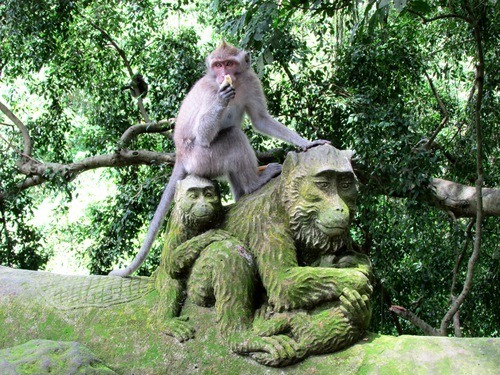 The highlight of our day in Ubud was our visit to the Sacred Monkey Forest Sanctuary of Padangtegal, just south of Ubud. Inside the sanctuary were various Hindu temples, and the jungle surrounding them was stunning. The lush vines, towering trees, and almost swampy mugginess reminded this childhood Star Wars fan of the Dagobah system, and I do not think I would have been surprised if Yoda had hobbled out from behind a tree to impart a few words of wisdom. But though its scenery was gorgeous, the most memorable part of the Sacred Monkey Forest Sanctuary was, unsurprisingly, the monkeys. 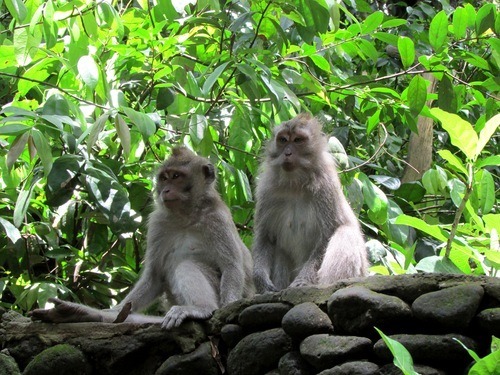 The sanctuary is home to over six hundred long-tailed macaques, which unabashedly climb over the statutes and temples. 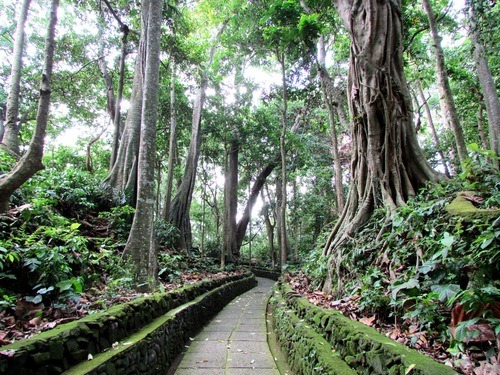 Tourism to the Sacred Monkey Forest Sanctuary has grown exponentially in recent years, a phenomenon which, while good for the economy, has changed the way those who work in the sanctuary, and in the surrounding village, endeavor to preserve the integrity of the area. As I unintentionally became the playground for a pair of juvenile macaques, and watched the unruly adult male who had decided I was not allowed to finish my vitamin water utilize his opposable thumbs to take off the cap and drink it himself, I could not shake the thought that this was touristic culture that even the wildlife could escape. At the same time, I was fascinated by the amazing adaptability of the creatures that seemed to generally go about their lives in a symbiotic relationship with the humans around them. 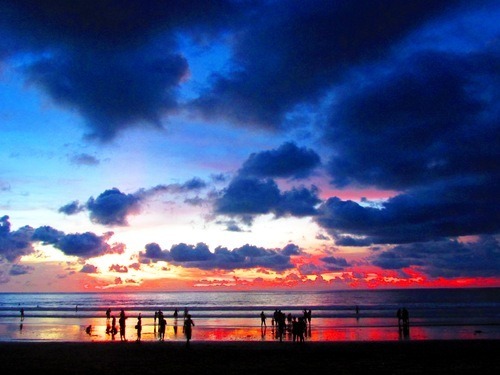 I was not always at ease in Bali, probably because it was the first time I was a proper tourist in this country. Prior to my holiday travel, I had always stayed with another ETA when I left my own site, and so while I was partially a tourist, I was also a friend being shown around the town that had become home for someone I care about. Bali was foreign and I was not with anyone who had created familiarity out of it, which occasionally made its stark contrast to my understanding of Indonesia a source of discomfort. However, even as much of the Westernization of Bali felt uncomfortable, there is no denying that I benefited greatly from it, and quite honestly enjoyed much of it. 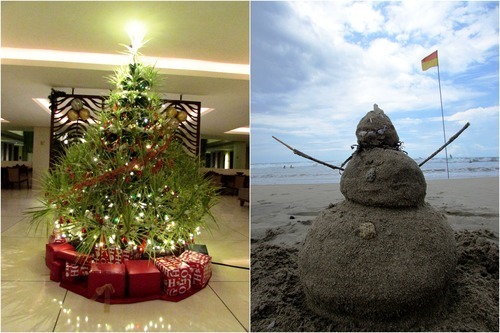 I spent my Christmas day learning how to surf and building “snowmen” out of sand on Kuta beach, and everywhere we went we were told “Merry Christmas,” even though we were in no way in a Christian-majority part of Indonesia. Had I spent the holidays in a less touristy city, my experience would have been very different, and I found myself problematically thankful for it all. I was in Bali for a mere four days, and I will not pretend to have the experience or the anthropological understanding to draw any clear conclusions from my time there. But spending my holidays there gave me a fleeting look at an Indonesia that is very different from where I live, and will help me to further understand the discrepant parts that somehow come together to create the whole that is Indonesia. And that is something for which I can uninhibitedly be thankful. As an ETA, I spend a lot of my time in classrooms fulfilling my role as a Teaching Assistant: planning activities to help students actually use English in realistic ways, working one-on-one with students to help them improve their English writing and speaking skills, and explaining the pain-in-the-bum subtleties of the English Language that sometimes puzzle even my co-teachers, not to mention native speakers. However, the other part of my role as an ETA is that of a cultural ambassador. 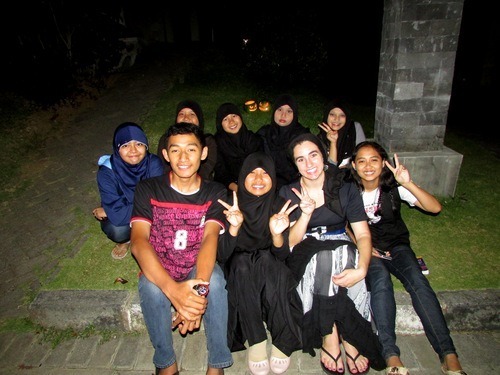 This role has led me to share some of my personal experiences with the small cultural anecdotes found in the student’s textbooks, to have long conversations with students over plates of nasi or mie about the similarities and differences between America and Indonesia that I have noticed thus far, and to give presentations to entire campuses about diversity in America. One of the aspects of American culture my students seem to be most interested in is the holidays that are somewhat unique to America. I have probably answered hundreds of questions about Independence Day and Thanksgiving, but the holiday with which my students seem most fascinated is Halloween. So when October came around, I decided I needed to find a way to bring Halloween to my students. It is important to note that my even being permitted to plan any kind of event for Halloween is a testament to how privileged I am in my placement. 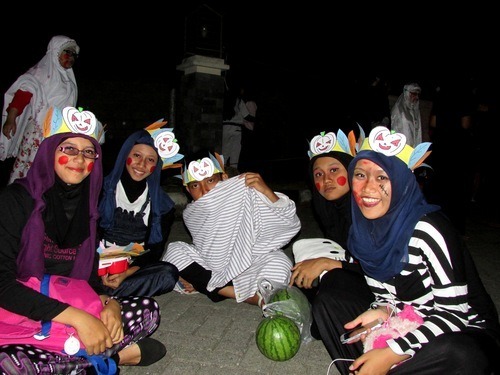 Many ETAs were not permitted to introduce their students to Halloween, because it was perceived as contradictory to the standards of their area’s most prominent religion, be that a form of Islam or of Christianity. This is not limited to Indonesia, of course, and I had a number of wonderful conversations with various students and teachers throughout the month of October about how, due to the diversity of religions and other belief systems in America, not all Americans celebrate Halloween, and those who do celebrate Halloween do not do so in the same way. Because I was initially worried about how Halloween would be perceived here, I merely proposed the idea of carving Jack O’ Lanterns with students. 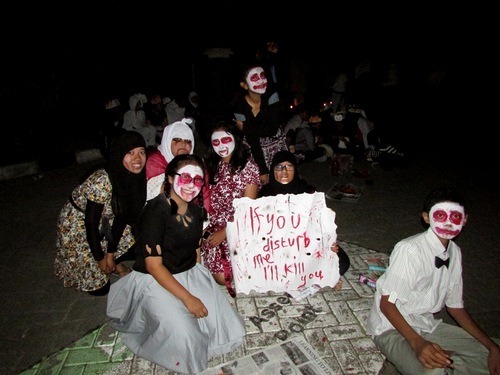 However, when I brought my idea forward, the students, as well as the adults, who are part of the dorm committee begged to be able to have costumes and scary stories as well. Though I worried I would not be able to put together such additions in time, I could not bear to tell them no. And so my small Halloween celebration grew. 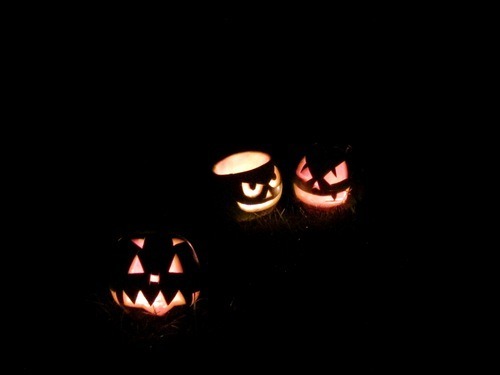 The day of the Halloween Party came. I had not had time to shop for a particularly complicated costume, so I dug into my closet for ideas, and eventually utilized the many scarves I had brought with me, as well as a deck of Harry Potter playing cards, to become a fortune teller. It is not the best costume I have ever developed, but considering the tiny size of my wardrobe here, I’m quite proud of how it turned out. I quickly practiced a favourite scary story from my childhood, grabbed my shopping bag full of candy for trick-or-treating, and headed to the party. 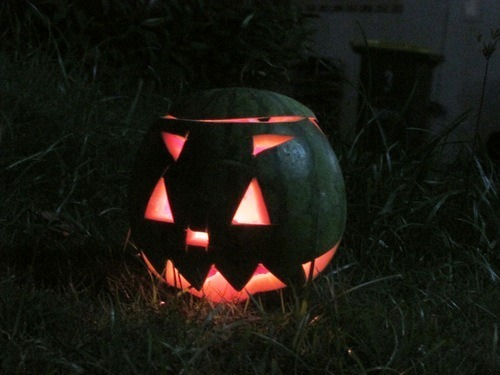 Of course, our Halloween celebration was not identical to those found in the United States, but the spirit of Halloween still permeated the event. 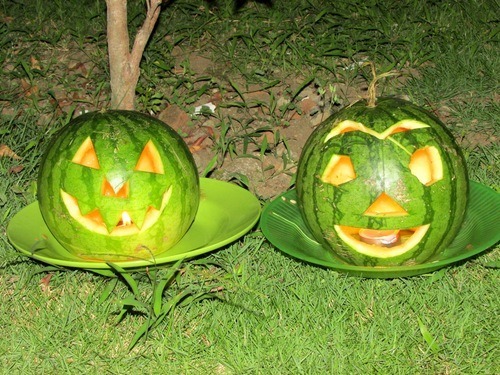 We were unable to acquire pumpkins to carve, and so used watermelons as an alternative, and my students’ artistic abilities were able to shine, quite literally, though the Jack O’ Lantern carving. I was secretly quite glad that I was unable to carve my own in between helping groups of students, for my haphazard carving skills usually produce a terrifying result, even if I’m aiming for adorable. I would have been embarrassed to place such a disaster next to the work of my students. It was hard to believe that they had never carved a Jack O’ Lantern before, the way they expertly sketched and carved out classic Halloween faces. Those students who dressed up had costumes that put mine to shame. They had put together amazing outfits, and even used home-made face paint and marker to create scars, hollow eyes, and even dripping blood. 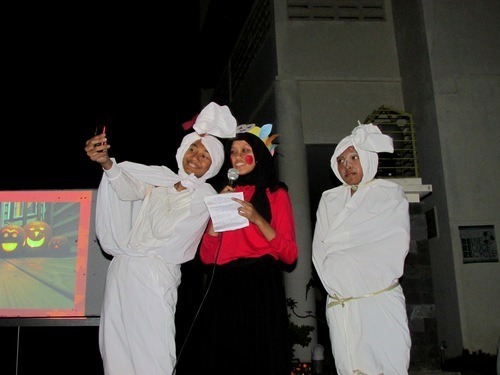 While many students came to the festivities dressed as vampires and zombies, a number of them also came as traditional Indonesian ghosts, such as Pocong (pronounced “Poh chong”), which I have often heard called the Indonesia jumping ghost. Some costumes were adorable, and some were terrifying. Many of the students also utilized their costumes later on, while they were telling scary stories, most of which were original compositions that combined Eastern and Western influences. I had managed to create enough activities to include the entirety of my second campus, and my site mate even came to the party, and I found myself more than once just standing with a stupid smile on my face, so grateful that my students’ eagerness to participate in Halloween was able to create a magical experience out of what—due to various complications, changes, and setbacks—was mostly last-minute planning on my part. Throughout the night, students thanked me again and again for their “first Halloween Party!” but I told them honestly that is was they who needed to be thanked. I’ve had the opportunity to attend a number of wonderful Halloween celebrations in America, full of fright and fun and in the company of friends that I love; but I have never before seen the kind of enthusiasm for Halloween night that I saw from my students, and they may have managed to do Halloween better than many Americans. I will never again be able to go into the Halloween season without thinking of my incredible students here, and the greatest Halloween experience anyone could have asked for.